This summer has been an outstanding one for Team Raptivity and its huge customer base. 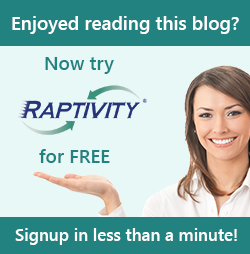 Raptivity has skillfully handled customer requests for new age features and introduced some new cracking interactions. And to top it, Team Raptivity is happy to announce this new initiative by which Raptivity users will now have dedicated professionals to cater to their queries on Raptivity software. These individuals are “Raptivity Valued Professionals”, who are experts in their domain of working. We reckon to get you acquainted with them so that you have a brief overview of their expertise. You could best utilize their support for resolving queries related to Raptivity software, tips and tricks on easy integration of interactions in other authoring tools like Lectora, Captivate, Articulate, creation of elearning and mlearning courses, etc. With this initiative, we expect Raptivity users to be exposed to the unchallenged capabilities of Raptivity - a rapid interactivity builder. You could reach them by registering at InteractivityHub, the online community of Raptivity and posting your queries to them. Team Raptivity hopes that ardent users would be overwhelmed with this new initiative of Raptivity and would explore connecting with Raptivity Valued Professionals for more insights. Do share your ideas and suggestions by commenting on this blog.